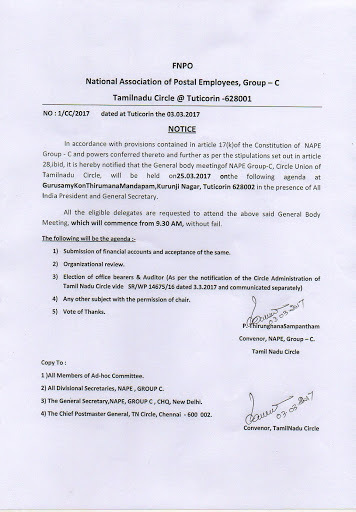 2017-02-26 ~ National Association of Postal Employees, Tirunelveli Division. Central Information Commission issued a Notice to Department of Posts & NUGDS for a final hearing regarding workload points of GDS. Latest News from Federation Website. Please visit http://judis.nic.in/Dist_Judis/CaseNo_Cat_Qry_Erna.asp for details. Dated this Thursday the 2nd day of February , 2017. Post Master Grade I, Jubilee Mission, P.O. Melangady P.O. Kondotty, Pin 673 638. Punnapully House, Kanjany P.O. Pin 680020. The applicants are aggrieved by the refusal of the respondents to grant them notional dates of promotion to the cadre of Postmaster Grade I and also the refusal to consider them for promotion to the cadre of Postmaster Grade II. 2. The cadre of Postmasters comprising of four grades, (Postmaster Grade I, II,III and Senior Postmaster) was created on 9 th September, 2010 and the recruitmentrules for the said cadres was promulgated. The applicants were all working as Postal Assistants at that point of time. They all had more than five years of service as on 1.1.2011. Applicants 1, 2 and 4 to 9 had been granted MACP I, and was already drawing pay in the pay band 5200-20200 plus grade pay of 2800 with effect from 2008. The third applicant was granted MACP I and given the grade pay of Rs. 2800 with effect from 2012 onwards. Being fully qualified for the post of Postmaster Grade I, notified by Annexure A3, the applicants applied to appear for the examination. Hall tickets were issued to all the applicants. It is contested that the respondent on the ground of pending litigation before the apex court involving employees from Kerala directed the examination contemplated under Annexure A3 to be adjourned sine die. 3. While the examination was not conducted in Kerala, the examinations were conducted in other circles. Based on results thereof, promotions were made to the cadre of Postmaster Grade I in all other circles except Kerala. The examination in Kerala was conducted in 2013. The applicants appeared for the test and were successful. Based on Annexure A7 results, the applicants were appointed as Postmaster Grade I, and they took charge on various dates in April-May, 2014. In other circles, successful candidates were appointed to the cadre of Postmaster Grade I in July- August, 2011 itself, while for no fault of the applicants, in Kerala the appointment was delayed to May 2014. When the question of consideration for promotion to Senior Post Master will arise, the applicants argue that they would be put to a disadvantage in the All India Seniority List as their date of entry into the initial cadre was delayed due to no fault of applicants. There will be none from Kerala for two years for being considered for promotion as Senior Postmaster due to the adjournment of the examination which ought to have been conducted in June, 2011.
qualifying/eligibility service are being considered for promotion, their seniors would also be considered provided they are not short of the requisite qualifying service by more than half of such qualifying/eligibility service or two years, whichever is less. The third applicant was granted MACP I, in the grade of Rs. 5200-20200 + Grade Pay 2800 with effect from 2011. He has already completed four years in the grade pay. But the respondents argue that applicant is not drawing the grade pay in the grade of Postmaster Grade I. He is drawing Grade Pay of Rs.2800/- only in the feeder grade of Postal Assistant and not in the grade of Postmaster Grade I as specified in the Recruitment Rule. The posts of Postmaster Grade II are being manned by personnel who are not qualified to be holding those posts as per Annexure A1 rules. In the other circumstances, the first applicant submitted a detailed representation. Similar representations were made by the other applicants also. A total of 34 posts of Postmaster Grade III and 36 posts of Postmaster Grade II are sanctioned in Kerala Circle. Of 36 posts of Postmaster Grade II and 35 posts Postmaster Grade III identified in the Kerala Circle, only 8 posts in Grade II and Postmaster Grade III have been filled up. 5. The applicants contest the refusal to grant the applicants notional promotions to the postmaster Grade I, with effect from 2011 considering the fact that the examination was adjourned only in Kerala, and in other circles it was conducted in a timely manner. Applicants also contest the refusal to consider them for promotion as Postmaster Grade II based on their experience in the grade of Rs.5200-20200 + Grade Pay 2800 despite availability of vacancies. 6. The respondent in the reply statement submits that all applicants joined the Postmaster Grade on various dates in April and May 2014. 7. The vacancies in Postmaster Grade II posts was requested to be filled up by promotion from amongst Postmaster Grade I with 6 years of regular service in the grade including regular service in LSG, if any. Thus, even if it is assumed, though not admitted by the respondents, that the applicants are granted notional promotion to the cadre of Postmaster Grade - I, they still are not eligible for promotion to Postmaster Grade II without fulfilling the mandatory service of 6 years of regular service in Postmaster in Postmaster Grade I. 8. In order to ensure that professionally qualified, trained and meritorious officials head important Post Offices, it was decided vide Annexure A.1 to introduce a separate cadre of Postmasters by carving out the posts from the existing General Line posts. New Recruitment Rules dated 9 Sept 2010, Annexure A.1, were framed and notified. As per notified Recruitment Rules initial constitution of various Grades of Postmasters had to be done by inviting options/applications from the existing incumbents of LSG, HSG II and HSG I Post Offices and PS Group B. In subsequent years all the vacancies in Postmaster Grade I were to be filled up through an LDCE from amongst the Postal Assistants with 5 years regular service in the grade and all the vacancies in Postmaster Grade II post had to be filled up by promotion from amongst Postmaster Grade I with 6 years regular service in the grade including regular service in LSG, if any. Out of the total 299 General Line LSG posts, 125 posts were identified for Postmaster Grade I and willingness was called for from amongst the LSG officials for completing the initial constitution process. 9. Respondent argues that a number of cases with respect to determination of the seniority of the officials for the purpose of promotion to LSG were pending before various courts in 2010. As such, there were only 39 LSG officials in position in the circle in 2010. Out of the 27 willing LSG officials, only 14 officials who were found fit were promoted to PM Grade I vide letter No. ST/3-1/PMC.2010/Dig dated 01.04.2011. Hence, the process of initial constitution could not be completed. 10. Third Respondent was advised by the first Respondent on 19.05.2011, that there was no other option other than to await the decision of the Apex Court before the vacancies in LSG were filled up by the Circle and as such, action for filling up the unfilled posts of Postmaster Grade I under initial constitution clause as well as Departmental Examination would have to be taken only after the decision of the Apex Court. First respondent also directed vide Annexure R.2 that Postmaster Grade I examination scheduled to be held on 12.06.2011 need not be held in Kerala Circle. After settlement of various court cases, DPC was convened on 17.04.2013 for promotion of eligible Postal Assistants to the cadre of LSG in 2013 for the vacancies from 2009 and 150 officials were promoted to LSG cadre vide letter No.St/5-2/2012 dated 02.05.2013. Willingness was called for from these officials for Postmaster Grade I and out of the 24 willing officials, the eligible 23 officials were promoted to Postmaster Grade I vide letter dated 28.06.2013.
postpone the LDCE in Kerala Circle. Soon after the initial constitution process was completed, the examination was duly notified without any delay vide Annexure A-6. In Nirmal Chandra Sinha v. Union of India, C.A.No.8058 of 2001 decided on 31.03.2008 that a promotion takes effect from the date of being granted and not from the date of occurrence of vacancy or creation of the post. Respondent also quotes Tribunal's order in O.A. No. 145/2010 which held that it is settled law that the promotion takes effect from the date of being granted and not from the date of occurrence of vacancy or creation of posts. 12. We hold the view that the above orders are not applicable when the seniority of a select group similarly placed is depressed on account of date of examination being deferred and which had an impact on determining All Indian Seniority. 13. Respondent argues that such a situation did not exist in any other circle and the examination was conducted in all circles except Kerala. Respondent quotes Apex Court in State of Mysore v. G.N. Purohit, 1967 SLR (SC) 753, that it is said on behalf of the respondents that as their chances of promotion have been affected their conditions of service have been changed to their disadvantage. We see no force in this argument because chances of promotion are not conditions of service. 14. Annexure A.1 recruitment rules stipulate that the posts of Postmaster Grade II are to be filled up by promotion from the officials in Postmaster Grade I, in the pay band 1 of Rs.5200-20200 + Grade Pay Rs2800/- with six years of regular service in the Grade including regular service, if any, in Lower Selection Grade and applicants did not possess this prescribed qualification. The applicants become eligible for consideration only in April/May 2020 if May 2014 was taken as date of recruitment. The applicants are attempting to substitute 'Grade Pay' with 'Grade' Postmaster Grade I in Pay Band Rs.5200-20200 + Grade Pay Rs.2800 cited in the recruitment rules. Six years of regular service in the Grade mentioned in the latter part of the rule cited in para 3 above categorically means six years of regular service in Postmaster Grade I and not six years of service in the Grade Pay of Rs.2800/- as the rule has to be read in its entirety and not in parts. A 2. creation of cadre notification. In accordance with Annexure A2, 36 posts in General line HSG II and 35 posts in General line HSG I were identified for Postmaster Grade II and Grade III respectively. Out of the 36 posts in PM Grade II only 8 posts could be filled up from amongst the willing officials in the HSG II cadre under the initial constitution process. In accordance with Annexure A1, a DPC was convened on 05.06.2015 to consider 18 officials in PM Grade I who were eligible for promotion to PM Grade II since they had completed six years of service in PM Grade I cadre including regular service in the LSG cadre. 17 eligible officials were promoted to Postmaster Grade II vide Memo No. ST/3-1/PM Grade II/2013 dated 10.07.2015 and in the case of one official, the proceedings of the DPC is kept in a sealed cover in view of the currency of the penalty. The applicants in this O.A.will be duly considered for promotion when their turn comes, in accordance with the recruitment rules governing the field. The respondents argues that eligibility of being considered for promotion to the Grade of Postmaster Grade II is six years of regular service in Postmaster Grade I and not in the grade pay of Rs.2800/- as construed by the applicants. 16. We have heard the learned counsel appearing on both sides and perused the records. 17. This case was argued with O.A. No.351/2016. The circumstances in this case are different as the delay was not on account of applicants but arose due to a case awaiting decision of the Apex Court for promotion of Postal Assistants to LSG cadre, the LSG cadre being the initiation feeder cadre for PM Grade I. The applicants however bring to our notice that as per Annexure A11 (1) and A11(2) NIC Supreme Court Case Status Report produced, which indicate that SLP (Civil)18876 of 2011 filed by UOI and Anr vs. M.P. Sudhakaran Nair and 18880 of 2011 filed by UOI and Ors. v. N.J.Tom Thomas & Ors was disposed of on 8.7.2011 one month after all India scheduled date of examination. The disposal of the cases by the Apex Court gave a quietus to the LSG seniority matter and the promotion to LSG and their subsequent fitness for initiation to Post Master Grade I could have been finalised immediately thereafter and exam for unfilled vacancies of Post Master Grade I followed, and initial constitution clause been completed. Or a second option would have been to hold the examination on schedule date in Kerala stating that the result will be finalised based on number of unfilled posts arising out of the final disposal of SLP's followed by initiation by option to PM Grade I, and resultant vacancies arising for filling up by examination. This would have established applicants rank in the examination, and date of entry based on their date of joining of immediate junior in the all India rank list after the initiation clause was operated. However in the absence of such a decision at the appropriate time, it is left to the Tribunal to find a solution to this matter which was not appropriately handled. Whereas we agree that had the exam results been declared, before obtaining the willingness of eligible LSG officials, it would have been injustice to them. But we also note that by delaying entry by examination for unfilled vacancies and determining their seniority along with others similarly placed by an All India Examination was also injustice to the applicants. For no fault attributable to them, their seniority was depressed. The circumstances could have been moulded to prevent such a depression. 18. Whereas we note that respondents cannot be solely held responsible for the litigation which caused the delay, they could have moulded their response to the creation of the cadre by examination. The examination could have been held as scheduled and the result kept as undeclared subject to the finalisation of the court case and finalization of the initiation process. Applicants prayer is for pre-dating the appointments made pursuant to LDCE in a manner as if the right thing was done at the right time. The claim is for appointment to be made to the Postmaster Grade I cadre from the date on which such appointment were made to those similarly placed in other circles based on a common examination. There was no judicial stay to hold examination in Kerala. However the determination of examination based vacancies, subsequent to following the initiation based filling up of posts, was an unknown factor due to pending litigation. Though this was a bottleneck, it was not an insurmountable one. The examination result of Kerala Circle could have been withheld, pending finalisation of LSG seniority and initiation to Postmaster Grade I entry cadre in the Circle which would define the number of vacancies to be filled by examination. which such promotions were granted to the last candidate for the examination conducted in 2011. Applicants will be treated as placed at the bottom of the all India seniority list of 2011 exam, as their interpolation in the list of actual entrants to PM Gr.I 2011 Exam would cause injustice, to those who actually appeared in the 2011 exam and whose seniority stands determined. 20. Applicants argue that there are a lot of vacancies of Postmaster Grade II, available in the Kerala Circle. As per Col 12 of the rules, 'Postmaster Grade I, in the pay band 1 of Rs.5200-20200 + Grade pay Rs.2800/- with six years of regular service in the Grade including regular service in Lower Selection Grade' is entitled to be considered for promotion. Based on the rule quoted applicants argue that they have more than six years of regular service as on date in the scale of Rs.5200-20200 + Grade pay 2800, on the ground that they are granted MACP I in 2008. [ Emphasis provided for understanding Recruitment Rule]. Applicants are taking advantage of absence of the designation Postmaster Grade I being mentioned in the latter part of the recruitment rule quoted above. Whereas in the former part of the rule it is clearly stated that Grade Pay Rs.2800/- should be drawn in the grade of Postmaster Grade I. Hence the hair splitting interpretation to read Grade Pay without the designation attached is not acceptable. Hence as regards the second prayer the applicants will also be treated at par with all the similarly placed persons of 2011 Examination as per provisions of Annexure A1`Recruitment Rules, and the manner in which qualifying service of similarly placed persons of 2011 Examination for promotion to PM Grade II was determined. Accordingly the second prayer is dismissed. 21. O.A. is disposed of accordingly allowing the first prayer only. No order as to costs. As the interest is tax-free, the effective pre-tax yield for someone paying tax at 10.3 per cent, 20.6 per cent and 30.9 per cent rates will be 8.91 per cent, 10.07 per cent and 11.57 per cent per annum respectively. The Indian Railways and the Department of Posts on Monday entered into a partnership for facilitating parcel services utilising the space in the guard's compartment on selected trains, said an official. The arrangement will help both the postal department and private players transport their parcels, according to an official press release. "Parcel is the fastest moving freight business of the Indian Railways. Through this new Business Parcel Policy, not only India Post but any private player can also book space in trains for movement of their parcel," said Railway Minister Suresh Prabhu while launching the scheme here. Before rolling out this scheme on an all India basis, a test-run of the scheme was carried out on the Howrah-Dibrugarh Kamrup Express and Hyderabad-Nizamuddin Deccan Express. "After the success of the test, today this scheme is being rolled out at all India level," he added. As of now, the railways and the Department of Posts have selected five trains for this scheme. Shri T.K.Govindarajan Vice President FNPO, ShriR.Ravichandran, Secretary APSO and Shri.K.Kathirvel Secretary TS CL met CPMG Tamilnadu Circle and discussed issues related to TS CL of Chennai Sorting Divsion and Airmail sorting Division. முதல் கட்டமாக தமிழகத்தில் உள்ள 847 HSG II பதவிகளும் சுமார் 3000 LSG பதவிகளும் இனம் காணப்பட்டுள்ளது. அதன்படி 30 PA பணியிடம் LSG ஆக RLO, Foreign Post, CSD, PSD Chennai அலுவலகங்களிலும், 43 PA பணியிடம் LSG ஆக கோட்ட அலுவலகத்திலும், 48 LSG பதவிகள் தலைமை அஞ்சலகங்களிலும் மாற்றப்படும். 694 காசாளர் பணியிடங்கள் LSG பதவிக்கு உயர்த்தப்படும். ஒவ்வொரு தலைமை அஞ்சலகங்களுக்கும் ஒரு LSG பதவி CPC களில் ஏற்படுத்த பட்டுள்ளது. தமிழகத்தில் 41 LSG பதவிகள் BPC களில் ஏற்படுத்தபட்டுள்ளது. ஏனைய அனைத்து Single Hand & Double Hand SOs அலுவலங்கங்களும் LSG பதவிகள் ஆக உயர்த்தப்படும். அந்தந்த அலுவலகங்களின் பட்டியல் முழுமையாக வெளியிடப்பட்டுள்ளது. மூன்று தலைமை அஞ்சலகங்களிலும் CPC களில் PA பணியிடம் LSG ஆக மாற்றப்படும். 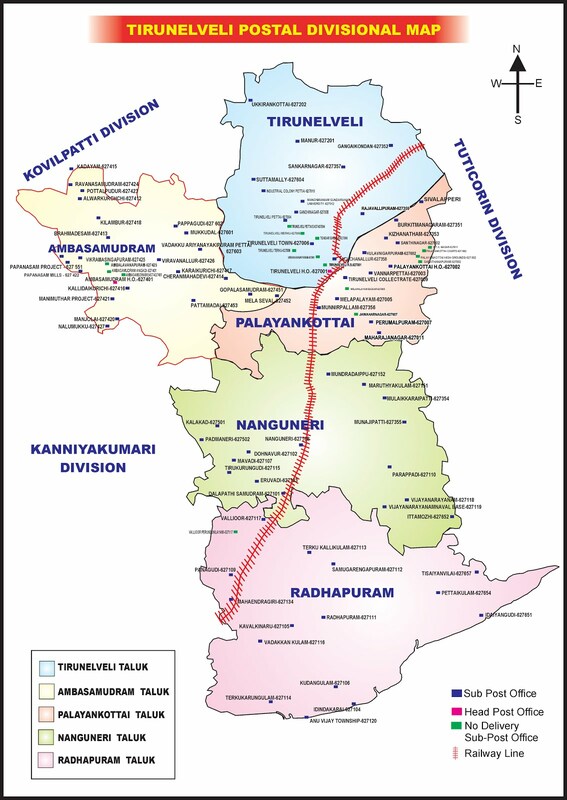 மூன்று தலைமை அஞ்சலகங்களிலும் ஒவ்வொரு PA பணியிடம் LSG ஆக மாற்றப்படும். வள்ளியூர் துணை அஞ்சலகத்தில் ஒரு எழுத்தர் பதவி LSG ஆக மாற்றப்படும். இவற்றுடன் 21 அலுவலகங்களில் காசாளர் PA பணியிடம் LSG ஆக மாற்றப்படும். பாளையங்கோட்டை தலைமை அஞ்சலகங்கத்தில் BPC ல் LSG பணியிடம் ஏற்படுத்தபட்டுள்ளது. ஆக மொத்தமாக 94 பதவிகள் LSG பதவியாக மாறுகிறது.